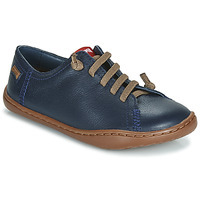 CAMPER - Shoes children-boys CAMPER - Fast delivery with Spartoo Europe ! SHOELOVERS WELCOME : WE LOVE CRAFT. WE LOVE BEAUTY. WE LOVE CREATIVITY. WE LOVE QUALITY. WE LOVE COLOUR. WE LOVE DESIGN. WE LOVE TRADITION. WE LOVE LEISURE. WE LOVE WALKING. WE LOVE TRAVEL. WE LOVE SPORT. WE LOVE NATURE. WE LOVE CITIES. WE LOVE THE OCEAN. WE LOVE YOU. WE LOVE LIFE. WE LOVE COMFORT. WE LOVE SHOES. DO YOU ? For Camper, everything began in 1877, in a family of Spanish boot makers who passed down their know-how for four generations. One century later, in 1975, Spain was liberated with the end of the totalitarian regime and the family took advantage of this to modernize their fabrication systems. Soon after, Camper took its first steps on the island of Majorca! Design, tradition, and family values have still remained the top priority of the brand. Camper has designed a range children's shoes in various designs and colours. 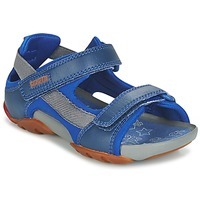 And even if you looking for shoes on sale, you will find that Spartoo UK always offers you the best promotions, available on our page of boys shoes. But Camper makes shoes for the whole family! Premium leather, trendy styles and maximum comfort all come together for a great casual shoe. In addition to being a classic shoe, the boys shoes from Camper are also very durable because of the quality leather and craftsmanship. And you can find similar features with the designer shoes by other brands like Nike and Converse, or hundreds of other brands on our fashion website. Whether it's trainers, smart shoes, loafers, flip flops or boat shoes, you'll find what you are looking for at a great price online. Does your child want to wear Camper trainers for a casual style ? Get him the pair of shoes he really wants, and while you're at it, have a look at our selection of sandals for this summer and skate shoes as well. And remember, with Spartoo UK you always get free delivery and returns, so what are you waiting for?